Pain provocation test - algopegs Webseite! The pain provocation test should be performed in a quiet and unobserved environment. The clothespin is applied on the nail of the middle finger without touching the nailfold. 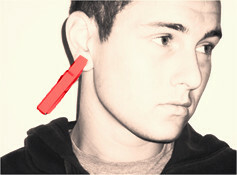 On the earlobe it is placed in the middle of the soft tissue without touching any cartilaginous parts of the ear. The Clothespin-Algometer is applied for 10 seconds. Participants indicate the pain intensity on a numeric analogue scale NAS (0= no pain, 10 = most pain imaginable). As pain increases crescendo-like within 10 seconds, the patient is to be asked explicitly about the pain intensity at the end of the test (at 10 seconds).